The annual Project show at Anna Pappas Gallery is always a cornucopia of boundary-skirting, concept-driven, multi-disciplinary works, curated around a sweeping, catch-all theme. Among each year’s group of artists, any visitor will find a handful whose work resonates. This year’s theme, DEATH | LIFE, delivers an especially broad range of responses, from the ritualistic to the poetic to the cerebral. DEATH | LIFE’s curator, Sebastian Goldspink, provides selected artists with a ‘catalyst’ rather than curatorial directive, in the form of a brief short story. A woman sits in a bath each evening and slides a gun into her mouth, thumb to the trigger. She fantasises about ‘after.’ But when one night ‘it happens,’ regret pours into the milliseconds of remaining awareness—her ‘death life’—and she experiences a profound ‘joining the dots’ of herself to everything: a vast realisation of meaning, consciousness and uncontrollable desire. It’s a dark, explosive story in many ways, but of DEATH | LIFE’s 11 artists, none appears to choose a head-on approach. For me the work that sidles poetically closest to the shadowed but near-bittersweet tale is Sam Fagan’s Grasp. Grasp consists of fine ink lines on archival tissue paper, so closely drawn that almost nothing of the near-transparent background remains; the whole piece is in saturated tones of charcoal, black and grey. A dark, eight-pointed star dominates, drawing the gaze towards a light grey centre, which glows like a portal around a further, small star. The tissue is so delicate that drying ink has left crinkled patches behind; there are minute tears where the drawing process itself has come close to ruining the work. Grasp feels like a threshold between one life and the next, arousing the desire to step into the weakness in the tissue to test the material at its delicate limit and risk breaking through. Michaela Gleave’s Orbit is a projected, circular sea/skyscape rotating at leisurely pace. 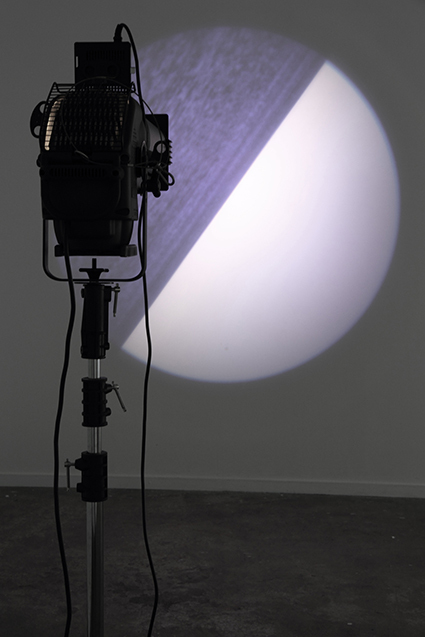 The projection apparatus stands before it at human height, like a machinic audience. As the image turns, perception shifts: when oriented naturally there is depth: one senses the distant horizon and the path across the sea. As it turns though, this ‘sense’ is gradually lost until, upside-down, the image seems reduced to two semicircles of colour and pattern. The movement through time and tumbling space bends understanding: sense and a kind of non-sense alternate endlessly. Always testing the edges of both aesthetics and the physical world, Gleave seems to be teasing out a kind of perceptual physics from Goldspink’s story’s shattering moment of truth. In a sense, ‘not-knowing’ is at the heart of DEATH | LIFE. Katie Lee’s work Untitled (Dreaming of a Technological Future) resists interpretation most strongly—troublingly. But rather than shrug shoulders, I find myself spending time with it. There are works one doesn’t ‘get,’ and works one doesn’t get but wants to, urgently. There are balls and chain, disconnected from one another; the balls are scattered on the floor. A ladder that doesn’t reach the ground. There are echoes of other Lee works, which articulate space so precisely and surprisingly, but in this space this quality gives way to something more emotive. The iron-like heft and texture of the chain (it is actually ceramic) presses against polished brass; the heavy balls seem poised for movement, just one point of each sphere in contact with the floor. I feel limitation and freedom, staying and leaving, the about-to-break and the unbreakable, the chance to climb out of it all. 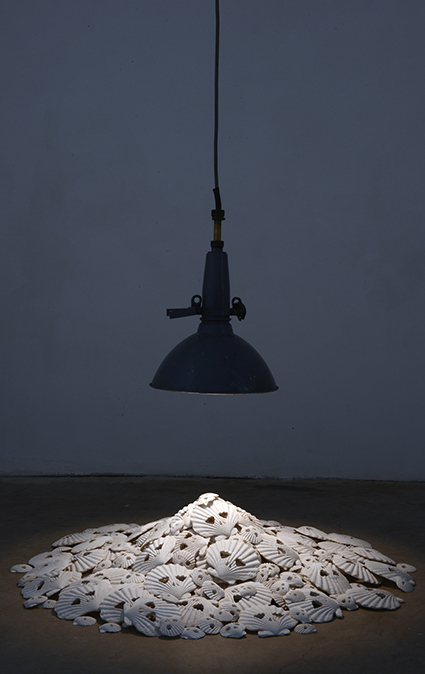 Like reincarnated Halloween pumpkins (there’s lots of shape-shifting in DEATH | LIFE) the myriad cast-resin seashells in Jason Wing’s Fossil Fuel look out uncannily from carved-out faces, lying on their bed of ocean sand, lit from above by a low-slung lamp. They are ghosts in all sizes, like adults and children washed up on shores of a world wrecked, perhaps, by those fossil fuels; or waiting to themselves be compressed over millions of years, becoming the fuel of the future. The work is quietly poetic, political and beautiful, suggesting things beneath that sand—oil reserves, sea graves, lost things. With no individual artist statements DEATH | LIFE leaves space for a more unmediated response than usual, yet it nudges the urge to contextualise and order. One can only ‘join the dots’ between the titles of the works and Goldspink’s catalytic story—but perhaps that drawing of one’s own chart amid so many different, unexplained charts, is both desire and solution: the mystery and the neat resolve at once.